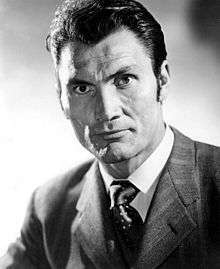 Jack Palance (born Volodymyr Palahniuk (Ukrainian: Володимир Палагню́к); February 18, 1919 – November 10, 2006) was an American actor and singer. He was nominated for three Academy Awards, all for Best Actor in a Supporting Role, winning in 1992 for his role in City Slickers. Palance was born in Lattimer Mines, Pennsylvania, the son of Anna (née Gramiak) and Ivan Palahniuk, an anthracite coal miner. His parents were Ukrainian immigrants, his father a native of Ivane Zolote in southwestern Ukraine (modern Ternopil Oblast) and his mother from the Lviv Oblast, an ethnic Pole. One of six children, he worked in coal mines during his youth before becoming a professional boxer in the late 1930s. Fighting under the name Jack Brazzo, Palance reportedly compiled a record of 15 consecutive victories with 12 knockouts before losing a close decision to future heavyweight contender Joe Baksi in a Pier-6 brawl. Years later he recounted: "Then, I thought, you must be nuts to get your head beat in for $200." With the outbreak of World War II, Palance's athletic career ended, and his military career began as a member of the United States Army Air Forces. Palance's face, which took many beatings in the boxing ring, was said to have become disfigured while bailing out of a burning B-24 Liberator bomber during a training flight over Southern Arizona (where Palance was a student pilot). His distinctive cheekbones and deep-set eyes were said to have been the result of reconstructive surgery. The story behind Palance's face was repeated numerous times (including in respected film reference works), but upon his death, several obituaries of Palance quoted him as saying that the entire story had been contrived: "Studio press agents make up anything they want to, and reporters go along with it. One flack created the legend that I had been blown up in an air crash during the war, and my face had to be put back together by way of plastic surgery. If it is a 'bionic face', why didn't they do a better job of it?" Palance was honorably discharged from the Army Air Corps in 1944. After the war, he attended Stanford University, leaving one credit shy of graduating to pursue a career in the theatre  During his university years, he worked as a short order cook, waiter, soda jerk, lifeguard at Jones Beach State Park, and photographer's model. His last name was actually a derivative of his original name. In an episode of What's My Line?, he described how no one could pronounce his last name and it was suggested he be called Palanski. From that he decided to just use Palance instead. Palance's acting break came as Marlon Brando's understudy in A Streetcar Named Desire, and he eventually replaced Brando on stage as Stanley Kowalski. In 1947, Palance made his Broadway debut. He debuted on television in 1949, and this was followed a year later by his screen debut in the movie Panic in the Streets (1950). The same year he was featured in Halls of Montezuma about the United States Marines in World War II, where he was credited as "Walter (Jack) Palance". Palance was quickly recognized for his skill as a character actor, receiving an Oscar nomination for his third film role as Lester Blaine in Sudden Fear. The following year, Palance was nominated for an Oscar for his role as the hired gunfighter Jack Wilson in Shane. Several Western roles followed, but he also played varied roles such as Dr. Jekyll and Mr. Hyde, Dracula and Attila the Hun. Three years before Palance played the role, comic book artist Gene Colan based his interpretation of Dracula for the acclaimed series The Tomb of Dracula on Palance, explaining, "He had that cadaverous look, a serpentine look on his face. I knew that Jack Palance would do the perfect Dracula." He became a Hollywood leading man, starring in Man in the Attic, followed by mid-1950s films such as The Big Knife, in which he played a conflicted Hollywood movie star, and I Died a Thousand Times, a scene-by-scene remake of High Sierra (1941) with Palance in the role played previously by Humphrey Bogart. Jean-Luc Godard persuaded Palance to take on the role of Hollywood producer Jeremy Prokosch in the nouvelle vague movie Le Mépris (1963). Although the main dialogue was in French, Palance spoke mostly English. Later, in 1966, he appeared in the television movie Alice Through the Looking Glass, directed by Alan Handley, in which he played the Jabberwock. He had a featured role opposite Lee Marvin and Burt Lancaster in the Western adventure The Professionals (1966). Palance starred in the television series Bronk between 1975 and 1976 for MGM Television. In 1980, Jack Palance narrated Canadian filmmaker Halya Kuchmij’s documentary The Strongest Man in the World, about Mike Swistun, a circus strongman who had been a student of Houdini’s. Palance attended the premiere of the film on June 6, 1980 at the Winnipeg Art Gallery. Palance's success on Ripley's Believe It or Not! and the international box-office hit of Bagdad Cafe (1987) resulted in a demand for his services. He made memorable appearances in Young Guns (1988), Tango & Cash (1989) and Tim Burton's Batman (1989). He also performed on Roger Waters' first solo album release The Pros and Cons of Hitch Hiking (1984). On November 10, 2006, Palance died of natural causes at age 87 at his daughter Holly's home in Montecito, California. His remains were cremated, with his ashes retained by family and friends. 1950 Lights Out Episode "The Man Who Couldn't Remember"
1952 Westinghouse Studio One Episode "The King in Yellow"
Westinghouse Studio One Episode "Little Man, Big World"
The Gulf Playhouse Episode "Necktie Party"
1953 Danger Episode "Said the Spider to the Fly"
The Web Episode "The Last Chance"
Suspense Tom Walker Episode "The Kiss-Off"
The Motorola Television Hour Scott Malone/Kurt Bauman Episode "Brandenburg Gate"
Suspense Episode "Cagliostro and the Chess Player"
Zane Grey Theatre Dan Morgan Episode "The Lariat"
1965 Convoy Harvey Bell Episode "The Many Colors of Courage"
1966 Run for Your Life Julian Hays Episode "I Am the Late Diana Hays"
1979 Buck Rogers in the 25th Century Kaleel Episode "Planet of the Slave Girls"
1981 Tales of the Haunted Stokes Episode "Evil Stalks This House"
2001 Night Visions Jake Jennings Episode "Bitter Harvest"
↑ "Jack Palance Biography (1920?-)". Filmreference.com. Retrieved 2016-09-25. ↑ "The Last Role of an American "City Slicker" with a Ukrainian Soul". Ukemonde.com. 2006-11-14. Retrieved 2016-09-25. ↑ "Entertainment | Veteran western star Palance dies". BBC News. 2006-11-11. Retrieved 2016-09-25. ↑ A History of the Polish Americans. Books.google.com. p. 113. Retrieved 2016-09-25. ↑ "Archived copy". Archived from the original on 2007-09-30. Retrieved 2007-06-04. ↑ Boxing Records Official records only show Palance in one sanctioned fight. His other fights may have been club fights. ↑ Enk, Bryan. "Real Life Tough Guys". Yahoo.com. Archived from the original on 30 July 2013. Retrieved 27 July 2013. ↑ "Accomplished Alumni - School of Humanities and Sciences". Humsci.stanford.edu. Retrieved 2016-09-25. ↑ "YouTube". YouTube. Retrieved 2016-09-25. ↑ "Jack Palance (1919–2006)". IMDb.com. Retrieved 2016-09-25. ↑ PALANCE FROM 'PANIC' TO 'PAGAN' By M. A. SCHMIDTHOLLYWOOD.. New York Times (1923-Current file) [New York, N.Y] 14 Mar 1954: X5. ↑ Field, Tom (2005). Secrets in the Shadows: The Art & Life of Gene Colan. Raleigh, North Carolina: TwoMorrows Publishing. p. 99. ↑ "Strongest Man In The World on Vimeo". Vimeo.com. 2015-10-07. Retrieved 2016-09-25. ↑ "Declaring 'I'm Ukrainian, not Russian', Palance walks out of Russian Film Festival in Hollywood". Ukemonde.com. 2004-06-11. Retrieved 2016-09-25. ↑ The Forest of Love. Summerhouse Press. 1996-01-01. Retrieved 2012-08-15. ↑ "The Republicans of Classic Hollywood". fan.tcm.com. Retrieved January 7, 2013. ↑ Learn-Andes, Jennifer. "Jump on Jack's stash". TimesLeader.com. Archived from the original on 2006-10-19. Retrieved 2006-10-08. 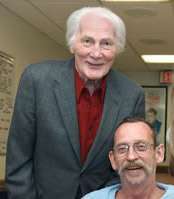 ↑ "Oscar winner Jack Palance dead at 87". CNN.com. 2006-11-11. Retrieved 2016-09-25. ↑ "Jack Palance (1919 - 2006) - Find A Grave Memorial". Findagrave.com. Retrieved 2016-09-25. ↑ "Archived copy". Archived from the original on 2008-12-26. Retrieved 2009-04-24. ↑ "Jack Palance". All Music. Retrieved 5 January 2015. Wikimedia Commons has media related to Jack Palance.